Other mistake: The alien that comes out of the dog is a lot bigger than the actual dog just seconds after it appears. 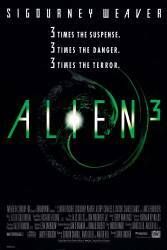 This only applies to the theatrical version, as in the extended version the alien comes out of an ox. Trivia: The plot of the movie is a combination of two spec scripts written for the film - one was by David Twohy (Riddick) who wrote a script set on a prison planet, and another by Vincent Ward, set on a monastery planet with the same characters and basic plot. Despite this, neither received credit for the screenplay (Although Ward received story credit). Trivia: Originally, the movie was going to be shot by cinematographer Jordan Cronenweth, but Cronenweth suffered Parkinson's Disease midway through filming and was let go by the line producer, being replaced by Alex Thomson. However, impressed by Cronenweth's work, David Fincher later worked with Cronenweth's son Jeff in nearly all of his future movies, resulting in two Academy Award nominations. Trivia: The film had a notoriously troubled production, with several writers and directors dropping out of the project during development. With a looming release date, sets were built and a crew was assembled before a script was even settled on, and the final draft had to be written around the sets that had already been built. David Fincher, then a popular music video and commercial director, was chosen to helm the film, but he had nonstop creative difficulties with the producers and studios. He has since gone on to disown the film, as he feels it isn't reflective of his vision. Kevin: This thing is really pissed off. Frank: Treat a queen like a whore and a whore like a queen. You can't go wrong. Question: In the scene where Ripley is describing the new Alien, she says it 'moves different to the other ones'. I could never get a good enough look at the alien to understand what she meant. What did she mean and why does it move differently? Chosen answer: She means that the alien it moves on 4 legs, whereas the other aliens moved primarily on two legs. This alien came out of a dog in the theatrical version and from an ox in the Assembly cut version, which can only move on 4 legs. This hints to the fact that the alien inherits the characteristics of its host. Question: Why didn't James Cameron return to direct? I know he made more than a name for himself after Aliens but I don't understand why the studio wouldn't ask him to return due to how good Aliens was. And why was a debut director (David Fincher) brought in with such a high budget? Wouldn't the producers think of choosing a more experienced filmmaker to deal with the budget and actors, considering how strong the previous films were? Chosen answer: I did a little reading on this. Cameron was adamant at the time that if there was an Aliens 3 that he, and his then-wife, Gale Hurd, would not be part of it. He said by the time a decision could be made about a another sequel and a plot was outlined, they would already be on to other projects, and he did not want to invest that much time and effort into one film franchise. He stated that money was not an issue, but he simply wanted to move on to other creative projects. Fincher had at this point directed several successful and lucrative, big money advertisements. The producers had enough faith in him to believe he was capable of directing the third film, but not so much to give him total creative control. There has never been a "directors cut" of Alien 3, as Fincher had so little control, that he pretty much disassociated himself from the film after completion.